The natural infection of phlebotomine sand flies by Leishmania parasites was surveyed in a desert area of Pakistan where cutaneous leishmaniasis is endemic. Out of 220 female sand flies dissected, one sand fly, Phlebotomus kazeruni, was positive for flagellates in the hindgut. Analyses of cytochrome b (cyt b), glycosomal glyceraldehyde phosphate dehydrogenase (gGAPDH) and small subunit ribosomal RNA (SSU rRNA) gene sequences identified the parasite as a Trypanosoma species of probably a reptile or amphibian. This is the first report of phlebotomine sand flies naturally infected with a Trypanosoma species in Pakistan. The possible infection of sand flies with Trypanosoma species should be taken into consideration in epidemiological studies of vector species in areas where leishmaniasis is endemic. Phlebotomine sand flies are blood-sucking insects belonging to the family Psychodidae in the order Diptera . The identification of sand fly species is epidemiologically very important because less than 10 percent of over 800 species described are responsible for the transmission of human pathogens such as flagellate protozoa of the genus Leishmania[1–3]. Some sand fly species are reported to transmit non-pathogenic flagellates of Endotrypanum species, originally identified as intraerythrocytic parasites of sloths in the New World . In addition, some Trypanosoma species of mammals, lizards, snakes and toads are transmitted by phlebotomine sand flies [5–11]. Since the flagellated forms of these parasites in the insect gut are morphologically similar to those of Leishmania, careful differentiation is needed for the epidemiological study of the vectors responsible for circulating Leishmania species. In this study, the natural infection of sand flies by Leishmania was surveyed in a desert area of Pakistan where cutaneous leishmaniasis is endemic. Sand flies were captured at Sono Khan (26° 52'N, 68° 03'E), Sindh Province on the 28-29th of June 2004. Shannon traps with a single compartment (1.0 × 1.0 × 1.3 meters in width, length and height, respectively) were used for the collection. The captured sand flies were dissected and the species identified based on the morphology of their spermathecae. These flies were also examined for Leishmania in the gut microscopically at × 400 magnification. The flagellates detected were inoculated into Difco blood agar (USMARU) biphasic medium containing 20% defibrinated rabbit blood, and later co-cultured with Spodoptera frugiperda Sf 9 insect cells in Grace's medium supplemented with 10% fetal calf serum. The rest of the flagellates in the gut of the sand fly were fixed in absolute ethanol for molecular biological analyses. Genomic DNA was extracted from the ethanol-fixed specimen, and the cytochrome b (cyt b) gene was amplified from the flagellate with primers prepared for the leishmanial cyt b gene (L.cyt-S: GGTGTAGGTTTTAGTYTAGG and L.cyt-R: CTACAATAAACAAATCATAATATRCAATT) . The glycosomal glyceraldehyde phosphate dehydrogenase (gGAPDH) and small subunit ribosomal RNA (SSU rRNA) genes were also amplified from the parasite using gGAPDH (G3: TTYGCCGYATYGGYCGCATGG and G5: ACMAGRTCCACCACRCGGTG) and SSU rRNA-specific primers (TRY927F: GAAACAAGAAACACGGGAG and TRY927R: CTACTGGGCAGCTTGGA) designed for trypanosomatids [13, 14]. The PCR products were cloned into the pGEM-T Easy Vector (Promega, Madison, WI), and the sequences of the inserts of the plasmids were determined by the dideoxy chain termination method using a BigDye Terminator v3.1 Cycle Sequencing Kit (Applied Biosystems, Foster City, CA). The gGAPDH and SSU rRNA gene sequences were aligned with CLUSTAL W software  and examined using the program MEGA (Molecular Evolutionary Genetics Analysis) version 4.0 . Phylogenetic analyses were performed by the neighbor-joining (NJ) and maximum parsimony (MP) methods with the distance algorisms available in the MEGA package . In this survey, 220 female sand flies were dissected for identification at the species level, and four species of the genus Phlebotomus were recognized. Among them, the two most prevalent species were identified as Phlebotomus (P.) sergenti (39 flies) and P. papatasi (27 flies). Other Phlebotomus species were P. nuri (10 flies) and P. kazeruni (1 fly), and the rest (143 flies) were identified as Sergentomyia species. The natural infection of sand flies by flagellates was detected in the hindgut of P. kazeruni. The cyt b gene sequence of the parasite was determined and analyzed with the BLASTn program. Unexpectedly, the sequence showed only 80.6-82.8% homology with those of Leishmania species and 83.6% homology with that of Trypanosoma (T.) brucei brucei, suggesting the flagellate belonged to the genus Trypanosoma. For further characterization, the gGAPDH and SSU rRNA genes were amplified from the flagellate and the sequences were analyzed since these genes have been well studied in trypanosomatids [13, 14]. The gGAPDH and SSU rRNA genes from the parasite (DDBJ accession numbers: AB520637 and AB520638, respectively) had more than 90% sequence similarity with those of amphibian trypanosomes such as T. fallisi, T. mega and T. rotatorium isolated from toad and frog. Phylogenetic analyses of the gGAPDH and SSU rRNA genes showed that the flagellate within P. kazeruni belongs to a clade of amphibian trypanosomes that includes a chameleon trypanosome, T. therezieni, but the sequences did not completely match those from any reported species (Fig. 1A and 1B). 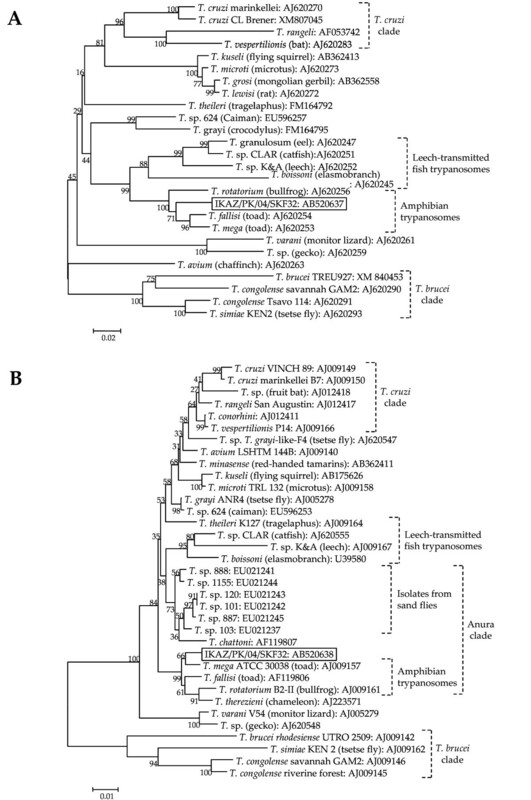 In addition, the parasite from P. kazeruni located in a separate clade from Trypanosoma species isolated from Amazonian sand flies, which have closer relationships with anuran trypanosomes captured in Amazonia  (Fig. 1B). These results strongly suggested that the parasite is a novel or genetically uncharacterized Trypanosoma species of an amphibian or possibly reptile. The parasite was successfully isolated as a culture (code number: IKAZ/PK/04/SKF32), which was confirmed to correspond to the original by the SSU rRNA gene analysis. The parasites markedly grew in Grace's medium in a co-culture with Sf 9 insect cells. On glass-slide smears prepared from the liquid culture, rosettes of parasites with an oval shape and epimastigotes varying in shape and length were observed (Fig. 2). 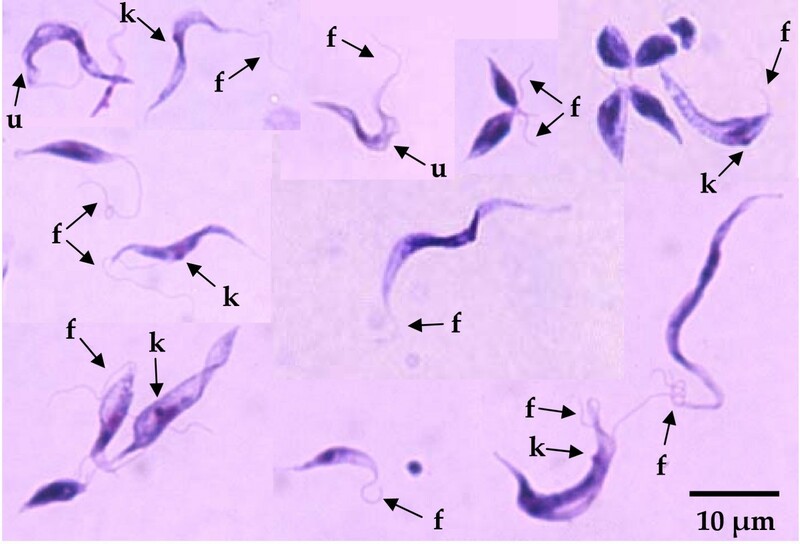 The parasites showed the features of Trypanosoma species, demonstrating characteristics such as a flagellum, a kinetoplast and an undulating membrane (Fig. 2). The research area was a desert community, and no amphibian was observed during the field trip. However, numbers of geckoes were found on the walls of houses, including sites where the Shannon traps were set. Thus, two Japanese reptile species (Takydromus tachydromoides and Gekko japonicus) and one Japanese amphibian (Hyla japonica) were intraperitoneally injected with 5 × 106 parasites as a preliminary search for the vertebrate host of the parasite; however, no parasites were observed in peripheral blood 3 weeks after the inoculation. The possibility of mammalian hosts was also addressed since the frog trypanosome, T. rotatorium, has been reported to infect mice under experimental conditions . The flagellate was inoculated intracutaneously into BALB/c mice and Mongolian gerbils (Meriones unguiculatus), but its DNA was not detected in peripheral blood and lymphoid tissues by PCR after 6 weeks. Based on the findings obtained by phylogenetic analyses and experimental infection, the parasite is presumably infectious to certain species of reptiles or amphibians in Pakistan. Further study is needed to identify the vertebrate host of the parasite species. The procedures were performed according to the recommendations of the ethics committee for animal experimentation, Faculty of Agriculture, Yamaguchi University. Phylogenetic tree of gGAPDH (A) and SSU rRNA (B) gene sequences among species. The gGAPDH and SSU rRNA genes were amplified from isolates of flagellates from P. kazeruni (IKAZ/PK/04/SKF32), and the sequences were determined. Phylogenetic analyses of gGAPDH and SSU rRNA gene sequences were performed by the neighbor-joining method together with those from 25 and 34 Trypanosoma species, respectively. The sequences from the database are represented by "the name of the species and isolate (host of the isolate): GenBank accession number". The scale bar represents 0.02 and 0.01% divergence, respectively. Bootstrap values are shown above or below branches. Trypanosoma species isolated from a phlebotomine sand fly P. kazeruni. Glass-slide smears were prepared from the culture in Grace's medium co-cultivated with Sf 9 insect cells and stained with Giemsa staining. Rosettes of parasites with an oval shape and epimastigotes varying in morphology were observed. k, kinetoplast; f, flagellum; u, undulating membrane. In the present study, a Trypanosoma species was isolated from P. kazeruni, which is a xerophilic species distributing broadly throughout North Africa and West Asia with little-known behavior [18–20], and the parasite was genetically characterized. To date, trypanosomes in sand flies have been reported on the African and American continents [5–11], but this is the first record of phlebotomine sand flies naturally infected by a Trypanosoma species in Asia. Pakistan is a tropical and subtropical country located in the northwest of South Asia and has areas where leishmaniasis is highly endemic [21, 22]. Although information on the endemicity and spread of cutaneous leishmaniasis is accumulating [23–26], the sand fly species responsible for the transmission is poorly understood. To date, no natural infections of sand flies by flagellates have been reported in Pakistan, and further efforts are ongoing on this matter. Thus, careful identification of the parasites is required for the epidemiological study of sand fly species responsible for the transmission of Leishmania protozoa. HK was fully involved in all phases of the study, including field research, sample collection, laboratory work, and writing the manuscript. HU and HS were involved in the molecular works. AMB, FRS and JHB organized and conducted field research. HU and YH conducted field research and sample collection. HK, HI and YH drafted the manuscript. YH supervised the overall conduct of the study. All authors read and approved the final manuscript.